The golfer says he will not be influenced by the fact that he has already won the European Tour’s Race to Dubai title. 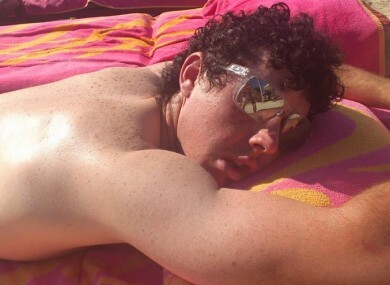 McIlroy's girlfriend Carolin Wozniacki tweeted this picture at the weekend. WORLD NUMBER ONE Rory McIlroy says he has enough motivation to do well at this week’s Dubai World Tour Championship, even though he has already secured the European Tour’s Race to Dubai crown. The 23-year-old from Holywood, Northern Ireland, emulated the ground-breaking feat of Luke Donald from last year when he won the Money List on both US PGA and European Tours. While Donald had to wait till the very last event on both sides of the Atlantic for his achievement, McIlroy wrapped up the PGA Tour honour without playing a single Fall Series event, and clinched the European Money List when he finished third in the Singapore Open a couple of weeks ago. Ahead of the $8 million season-ending tournament at the Earth course of Jumeirah Golf Estates here, McIlroy said: “I am obviously very proud and very honoured to have won the Race to Dubai this year. I’ve had four go’s at it since 2009. I came close a couple of times, and you know, it was great to be able to do it this year. “It’s been a phenomenal year, and I’ve still got one more tournament left and I want to try to finish the season strong. I really want to play well this week. This is definitely a great way to end what has been a great season. McIlroy, who missed the cut last week at the Hong Kong Open where he was the defending champion, said one of the best things about the 2012 season was the way he came out of the slump in form he experienced mid-way through the year when he missed three cuts, including the US Open and the BMW PGA Championship. “The slump…you know, it wasn’t as bad as people were making out, and I was just trying to tell everyone that at the time. “I knew it was close. I just needed a couple of good rounds just to get my confidence back again and get it back on track. “Felt like I did that in Akron this year at the Bridgestone, and then obviously going on to win my second major the week after and to play great during the playoffs in the States, as well,” said Mcilroy, who won four times during the year. McIlroy leads a stellar field of 57 players this week in Dubai. There have been three dropouts – Thomas Bjorn, Ross Fisher and Retief Goosen. Bjorn has had a recurrence of his neck injury, Fisher decided to stay back in the US where he has made it to the final stage of the qualifying school, while Goosen has still not started playing after his back surgery in August. Email “Rory McIlroy motivated ahead of Dubai finale”. Feedback on “Rory McIlroy motivated ahead of Dubai finale”.